Today I found out Silly Putty was invented by accident. Silly Putty was originally invented by James Wright, working at General Electric’s New Haven, Connecticut lab in 1943. At the time, the Allies were desperately short on rubber thanks to Japan invading various rubber producing countries in the Pacific Rim. This shortage on rubber was negatively affecting certain wartime production efforts. As a result of this, the U.S. government enlisted the aid of various companies to try and invent a synthetic rubber that could be made of readily available materials. It was during one of these attempts to create synthetic rubber that Wright mixed boric acid and silicone oil, making the first Silly Putty, which initially became known as “Nutty Putty”. Although the goo produced by the mixture obviously wasn’t likely to make a good rubber substitute by itself, Wright did discover it had a variety of interesting properties, but he still couldn’t find a good practical use for it. Wright then sent samples of it to scientists all over the world to try to see if they could think up or discover a use for it that he missed. Unfortunately, nobody he sent it to could come up with a practical use for his putty either and the invention stayed in relative obscurity for around six years. From 1943 to 1949, the primary use of Nutty Putty was just being passed around and played with at cocktail parties as a novelty item, for those few who got their hands on some. Eventually, this led to it coming to the attention of Ruth Fallgatter, who owned a toy store known as the “Block Shop”. With the help of marketing consultant Peter Hodgson, she put the item in her toy catalog as “bouncing putty”. 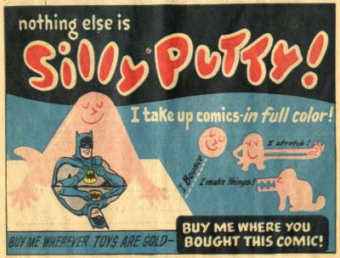 The putty went on to be the second best selling item in the catalog, behind Crayola crayons. Hodgson, who at the time was deeply in debt ($12,000), borrowed money to buy more of the putty and eventually the production rights, renaming it “Silly Putty”. He then hired some Yale college students to take the large quantity of putty and divvy it up into one ounce red plastic egg containers, which would sell for $1 each. Thanks in part to a “Talk of the Town” New Yorker article, as well as being debuted reasonably close to Easter, which was the inspiration for packaging it in an a plastic egg, Silly Putty became an instant nation-wide hit selling 250,000 units in the first three days and around six million units in the first year at $1 an egg, making it one of the fastest selling toys in history. Silly Putty was purchased by Binney & Smith, best known for their Crayola brand, in 1977, a year after Hodgson died. By the time of his death in 1976, Hodgson’s net worth was around $140 million. Binney & Smith not only started the Crayola brand, but they also are largely responsible for why tires are black today, instead of white. It turns out, adding carbon black to rubber, which is naturally white, makes a significantly stronger and longer lasting tire. Read more about this here. Earl Warrick at Dow Corning, and Roy McGregor also claim they invented Silly Putty before Wright. Indeed, they did independently invent Silly Putty. However, Wright is still considered to have been the first to invent the putty, including by Crayola who now owns the brand. Silly Putty was one of the things taken into lunar orbit in 1968 during the Apollo 8 mission. They principally used it to secure tools in place so they wouldn’t float away. Originally you could use Silly Putty to copy text from comics and newspapers and the like. This isn’t always true today due to a change in the inking process, specifically, the switch from petroleum based to soy-based inks in many newspapers. The word “Crayola” was originally thought up by Alice Binney. Binney, a one-time school teacher, combined the French word “craie”, meaning “chalk”, with “ola”, shortened from the French word “oléagineux”, meaning “oily”. Oléagineux derives from the Latin oleāginus, which is the adjective form of “olea”, meaning more or less “olive tree”. The French “craie” comes from the Latin “creta”, which also means “chalk”, and, in addition, can mean “clay”. Craie is also where “crayon” gets its leading “cray”, though the word “crayon” existed long before Crayola crayons were invented. It first appeared around the 16th century in the French language and meant “chalk pencil” and later just shortened to “pencil”, as it still means today. Hence, given the origin of the words, “Crayola crayon” more or less just means “Oily Chalk Pencil”. The exact composition of the original Silly Putty was: 65% dimethyl siloxane (hydroxy-terminated polymers with boric acid), 17% silica (crystalline quartz), 9% Thixatrol ST (castor oil derivative), 4% polydimethylsiloxane, 1% decamethyl cyclopentasiloxane, 1% glycerine, and 1% titanium dioxide.